WWE News: Mauro Ranallo says Road Travel for SmackDown Live "was going to kill him"
Mauro Ranallo left the SmackDown Live commentary booth in 2017 and was almost gone from WWE before becoming an announcer for NXT. Despite the rumours for this change, Ranallo said the decision was made because he couldn't deal with the travelling schedule for the show. Ranallo was the play-by-play commentator for SmackDown alongside JBL and David Otunga before leaving the show in March 2017. Many rumours emerged following his departure from the Blue Brand, but Ranallo would announce his new position with NXT later that month. In his interview with The MMA Hour with Ariel Helwani, Ranallo opened up about his mental health and how it prevented him from keeping up with the SmackDown Live travel schedule. “I was on the road every week. You add MMA and boxing and kickboxing to it. The road travel destroyed me. So, rumors and all this other stuff, what happened, honestly — and Ariel, you know how honest I’ve been in this thing — I had a breakdown in the Chicago O’Hare airport on my way to Pittsburgh to do SmackDown Live." Ranallo is considered by many to be the best commentator in WWE and many were happy that he stayed with the company after his breakdown. The documentary "Bipolar Rock 'n' Roller" will focus on his career as an announcer and will go into more detail regarding his battle with mental illness. 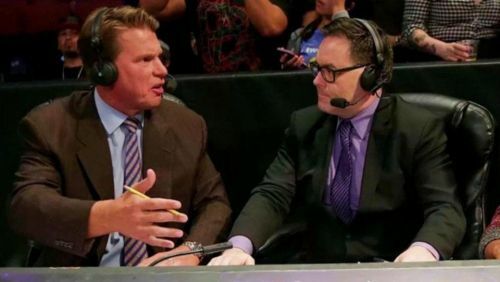 Ranallo has continued to deny JBL being the reason for his departure from SmackDown, so this may finally put those rumors to bed for good.